In order to enable a free flow of information and to integrate the community of qualitative sociologists, we have decided to create an open-access, international scientific journal. Qualitative Sociology Review publishes empirical, theoretical and methodological articles applicable to all fields and specializations within sociology. Every submitted paper is blind reviewed and quality-controlled by two reviewers. The Editorial Staff and Consulting Editors strive to operate at a high level of scientific quality. All sociologists who make use of an interpretative paradigm and a qualitative research methodology are welcome to submit their articles and support our initiative. of every scientist, whose work is a way of developing knowledge about the world and improving himself/ herself as a penetrating observer of this world. which manifest themselves in a respect for every human being and an interest in every opinion and mode of information, as the best way to discover the truth. of qualitative researchers who integrate through a common conception of science and through the discovery and explanation of social phenomena. which takes advantage of pluralism and diversity to accumulate knowledge about society that is available universally and is used to influence the integration and development of various aspects of society. integrating through a qualitative way of understanding social action, where humans are treated as subjects who create and change the social world around them. Our intent is to provide an interdisciplinary forum for a worldwide qualitative researchers community. All researchers for whom interpretative paradigm and qualitative methodology constitute the basic perspective for further analysis of social life as it occurs in specific social contexts are warmly invited to submit their papers and to partake, therefore, in our open access to scientific knowledge initiative. The editors of Qualitative Sociology Review welcome empirical, methodological and theoretical articles devoted to all fields and specializations within qualitative sociology. In order to facilitate our cooperation and to shorten the time needed for publishing your article, we recommend that you take the time to read the sections below before submitting a contribution to Qualitative Sociology Review. Manuscripts submitted to Qualitative Sociology Review should represent original work not previously published. They should not contain previously published materials and must not be under consideration for publication elsewhere. The article, or any part thereof, is in no way a violation of any existing original or derivative copyright. It is the authors’ responsibility to obtain appropriate written copyright permission for the reproduction of any copyrighted material, including images. 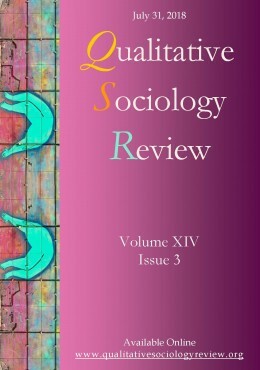 All manuscripts must be submitted to Qualitative Sociology Review via email: office@qualitativesociologyreview.org. All references that explicitly reveal the identity of the authors should be removed from the article. A separate document including name and email address of all contributors should accompany the submitted article. Texts are to be saved in Word format with a .doc, .docx or .rtf extension. All illustrations, graphics, photographic images, and other figures should be included in a separate file (saved in the following formats: JPEG, TIF, GIF, BMP, PNG). Title and number of the figure (in Arabic numerals, e.g., Figure 1, 2, etc.) should be included in the figure legend. All figures must be listed in the order in which they are mentioned in the text. An electronic cover letter must accompany each manuscript submitted to Qualitative Sociology Review. It must state that the material for which the authors have exclusive rights is original and has not been submitted for publication elsewhere (including websites). In order to prevent the practice of ghostwriting and guest authorship, the letter must also include a statement attesting and indicating the specific contribution each author made to the manuscript. Submitting a manuscript accompanied by the cover letter is interpreted as indicating that each author participated in the preparation of the article, and have reviewed and approve the manuscript as submitted to take public responsibility for it. The corresponding author(s) should email the cover letter to: office@qualitativesociologyreview.org. All sources of financial support for the work contained should be disclosed in the covert letter. Articles should be written in English only. Authors are kindly asked to comply fully with these requirements, as well as with the general construction of the article and style requirements listed below. Failure to do so may constitute grounds for the rejection of an article at any time during the editorial process. The article should include an abstract followed with keywords (5-10) at the beginning of the manuscript, an introduction involving theoretical inspiration in the proposed analysis, a paragraph in which the applied methodology is presented, a research study or the main theoretical argument, and a conclusion. Authors are asked to follow the accepted norms of academic writing, including the provision of accurate and complete references. The style requirements of Qualitative Sociology Review are modeled on American Sociological Association Style Guide (4th ed. ), 2010. For unpublished materials, „forthcoming” should be used to indicate material scheduled for publication, e.g., „… (Smith forthcoming).” For dissertations and unpublished papers, the date should be cited. If a source cited in another source is quoted, the name, date and page reference of the work in which information originated should appear first, followed by „as cited in” and the secondary source, e.g., „… (Mead 1934:78 as cited in Prus 1997:39).” Only the secondary source should appear in the reference list. The state abbreviation should only be included if the city of publication is not well-known. New York, Chicago and Los Angeles do not need a state abbreviation. Mead, George H. 1934. Mind, Self and Society. Chicago: University of Chicago Press. Mannheim, Karl. 1936. Ideology and Utopia: An Introduction to the Sociology of Knowledge. Translated by L. Wirth, E. Shils. New York: Harcourt, Brace & World. Berger, Peter L. and Thomas Luckmann. 1966. The social construction of reality. Garden City, NY: Doubleday. Belenky, Mary F., Blythe M. Clinchy, Nancy R. Goldberg, et al. 1997. Women’s Ways Of Knowing: The Development Of Self, Voice, And Mind. 10th Anniversary Edition. New York: Basic Books. Rose, Arnold M., (ed.). 1962. Human Behavior and Social Processes. Boston, MA: Houghton Mifflin. Sacks, Harvey. 1972. „On the analyzability of stories by children.” Pp. 325-345 in Directions in Sociolinguistics: The Ethnography of Communication, edited by J. Gumperz, D. Hymes. Oxford: Blackwell. Natanson, Maurice. 1962. „Introduction.” Pp. XXV-XLVII in Alfred Schutz: Collected Papers, Vol. 1, edited by M. Natanson. The Hague: Martinus Nijhoff. Blumer, Herbert. 1967. „Reply to Woelfel, Stone and Farberman.” American Journal of Sociology 72(4):411-412. Strauss, Anselm. 1982. „Interorganizational Negotiation.” Urban Life 11(3):350-367. Greenberg, Daniel S. 1991. „«Soft» Sciences Grow Up.” The Washington Post, November 13, p. A19. Smith, Herman W. and Takako Nomi. 2000. „Is Amae the Key to Understanding Japanese Culture?” Electronic Journal of Sociology 5(1). Retrieved May 5, 2000 (http://www.sociology.org/content/vol005.001/smith-nomi.html). Scheff, Thomas J. 2006. „Concepts and Concept Formation: Goffman and Beyond.” Qualitative Sociology Review 2(3):48-64. Retrieved January 12, 2007 (http://www.qualitativesociologyreview.org/ENG/Volume5/QSR_2_3_Scheff.pdf). Garfinkel, Harold. 1952. „The perception of the other: A study in social order.” Ph.D. dissertation, Department of Social Relations. Harvard University, Boston. Stepick, Alex and Carolyn D. Stepick. 1990. “What’s In It For Me? What’s In It For You? Ethnographic Research On The Possible Undercount of Haitians in Miami.” Research Report No. EX90/11, Center for Labor Research, Florida International University, Miami. Glaser, Barney. 2005. “The World-Wide Adoption of Grounded Theory.” Paper presented during the 37th World Congress of the IIS, July 6, Stockholm, Sweden. Endnotes should be replaced with Footnotes. Foreign words used in the text should be italicized. Commonly used foreign words or terms (e.g., ad hoc, per se, et al.) should, however, appear in regular type. We kindly ask authors to submit only carefully prepared manuscripts that are adjusted to these requirements. Articles that do not conform to the QSR Style Guide may be sent back to the author without review or put on hold until the submission is deemed in compliance with the requirements. Once the submitted manuscript is received, the author gets an email notification informing that the article in question entered the review process. Further communication and agreements will proceed via email. All articles submitted to Qualitative Sociology Review enter a two-step unbiased review process – only the manuscripts accepted by the QSR internal reviewers will enter a regular double blind review process. The editors will try to make a preliminary decision concerning the potential suitability of a manuscript for QSR within a few days. Manuscript decisions are based on editorial discretion and/or input from the peer review process. Once the submitted manuscript is reviewed, the corresponding author is informed about the process’ outcome, and gets the Reviewers Report on the article in question. All data that may reveal the identity of reviewers is removed from the Report. If recommendations regarding the current version of a manuscript are included in the Report, the author(s) is/are required to improve the paper according to the reviewers’ suggestions. The publication proceeds once the manuscript is improved and accepted by the editors. how can the article improve the Journal? Is it for example, elicit, controversial or important enough in any other way for social science to raise a discussion or inspire further research/considerations? The Journal strongly opposes the practice of ghostwriting and guest authorship. Therefore, the editors of Qualitative Sociology Review inform that all discovered instances of scientific unreliability will be revealed. Each author should have participated sufficiently in the manuscript preparation. All contributors who do not meet the criteria for authorship should be listed in an acknowledgments section. Examples of those who might be acknowledged include individuals who provided purely technical and writing assistance, or a department chairperson who provided only a general support. The editors of Qualitative Sociology Review reserve the right to correct minor stylistic and/or orthographic errors without consulting the author(s). As part of the submission process, authors are required to check off their submission’s compliance with all of the following items. Please note that submissions that do not adhere to these guidelines may be returned to authors. The manuscript represents original work not previously published and is not being considered for publication elsewhere. All references that explicitly reveal the identity of the author have been removed from the manuscript. The cover letter indicating the specific contribution each author made to the manuscript accompany the submitted article. Appropriate written copyright permissions have been secured for republication of any copyrighted material included in the manuscript. The manuscript adheres to Qualitative Sociology Review style requirements and/or the authors recognize that it is their responsibility to make the manuscript adhere to the QSR Style Guide as a condition of acceptance. The main purpose of Qualitative Sociology Review is to foster development of science and to enhance human knowledge. Therefore, the Journal and all published articles constitute a contribution to the contemporary social sciences. Since this will support the concept of an open access to scientific knowledge, the source should be mentioned if any materials published in QSR were cited elsewhere. By virtue of its appearance in this open access Journal, it is understood that the article is freely available for use without any special permission, with proper attribution, for cognitive, educational, scientific, and other non-commercial purposes. It is thus, forbidden to charge for access to this Journal or to put any limitations on the accessibility of released papers. Making use of the resources included in the Journal for commercial or marketing purposes requires special permission from the publisher. Authors submitting a manuscript to Qualitative Sociology Review do so on the understanding that published articles are freely available for non-commercial purposes. Possible commercial use of any published article will be consulted with the author beforehand. Publication of the article proceeds once the appropriate written copyright permissions for republication of any copyrighted material included in the manuscript have been secured. It is the authors’ responsibility to obtain written permission for publication of materials, which are protected by copyrights owned by a third party. Qualitative Sociology Review has a strict policy against plagiarism. Author submitting manuscript to QSR, warrant that it is his/her original work, and that he/she has secured the necessary written permission from the appropriate copyright owner or authority for the reproduction of any text, illustration, or other material. If any article submitted to the QSR is found to have breached any of these conditions, QSR reserves the right to reject that article and any others submitted by the same authors. Qualitative Sociology Review may also contact the authors’ affiliated institutions to inform them of its findings. Qualitative Sociology Review has a transparent publications policy. It is means that all authors must disclose any financial and personal relationships with other people or organizations that could inappropriately influence their work. It is the sole responsibility of authors to disclose any affiliation with any organization with a financial interest, direct or indirect, in the subject matter or materials discussed in the manuscript that may affect the conduct or reporting of the work submitted. All sources of funding for research are to be explicitly stated. If uncertain as to what might be considered a potential conflict of interest, authors should err on the side of full disclosure. Contributions from individuals who do not qualify for authorship should be acknowledged in the „Acknowledgments” section. This should include details of any other contributorship, such as data analysis, statistics, data collection, technical assistance, special thanks, personal assistance, and dedications. The „Declaration of Interest” and „Acknowledgements” sections will be made available to reviewers and will appear in the published article. Qualitative Sociology Review adheres to the Core Practices set forth by the Committee on Publication Ethics (COPE).